This document outlines StashAway’s investment strategy, ERAA® (Economic Regime-based Asset Allocation), and the framework that underpins it. According to the end-2017 SPIVA US Scorecard, more than 90% of professional portfolio managers underperformed on a relative basis. Several long-term studies have concluded that asset allocation is responsible for between 80% to 96% of a portfolio’s return profile. At StashAway, we deliver institutional-level asset allocation sophistication to everybody through a proprietary investment strategy, ERAA®, that leverages macroeconomic data to minimise risk and maximise returns for every portfolio throughout economic cycles. Pillar I: Economic Regimes Determine Asset Allocation - StashAway’s ERAA® looks at the relative rate of change between growth and inflation to define an economic regime, then makes informed asset allocation decisions. We have identified four distinct economic regimes, and built the appropriate asset allocations for each of them. The system will proactively determine a new asset allocation target for any given portfolio when the economic regime changes. In the face of unclear economic data, ERAA® evaluates the momentum of growth and/or inflation for clear guidance on direction. If the momentum is not solid enough to provide predictive guidance, ERAA® will adjust clients’ portfolios to an All-Weather strategy that optimises portfolios to withstand uncertain economic conditions. Pillar II: Risk Shield - ERAA® responds to abnormal market behaviour when market prices’ moving averages lead to two or more death crosses. In this situation, ERAA® overrules the economic-driven parts of the model (Pillar I), and moves customers’ portfolios to a protective asset allocation strategy until the markets regain clarity. Pillar III: Valuation Gaps - ERAA® uses medium-term valuation gaps and their mean-reversion to embed a forward-looking view on asset class performance. When any of the three pillars trigger a change in the optimal asset allocation for any risk point, a “re-optimisation” of the portfolios is triggered, with the dual goal of (i) maintaining risk constant across varying economic and/or market conditions and (ii) optimising returns in the new environment. Risk management is at the very heart of ERAA®, which is intrinsically designed to navigate the ups and downs of economic cycles. After in-depth backtesting, we confirmed that ERAA® would have outperformed in risk-adjusted terms during the 2008 Financial Crisis. Traditionally, portfolios have been optimised according to the Nobel Prize-winning Modern Portfolio Theory (MPT). However, academic and industry research indicate that MPT fails to consider the impact of external, changing economic conditions, and how they impact returns. Our strategy, ERAA® (Economic Regime-based Asset Allocation) enhances MPT by addressing external economic forces, which ultimately drive asset class’ returns, volatility, and correlations. ERAA®’s three pillars, Economic Regimes Determine Asset Allocation, Risk Shield, and Valuation Gaps, together deliver a macroeconomic portfolio management strategy that minimises risk and maximises returns for personalised portfolios across any economic environment. Before diving into the theory and practice behind ERAA™, it’s crucial that the reader fundamentally understands why ERAA™ applies economic data to asset allocation. According to the end-2017 SPIVA US Scorecard “over the 15-year investment horizon, 92.33% of large-cap managers, 94.81% of mid-cap managers, and 95.73% of small-cap managers failed to outperform on a relative basis”. In other words, only about 4-8% of active fund managers delivered positive returns against their benchmark. Data for other countries and time periods are comparable. Further, several long-term studies have concluded that asset allocation is responsible for between 80% and 96% of a portfolio’s return profile. For this reason, at StashAway, we do not engage in securities selection, and we refrain from using actively-managed funds; instead, we build our customers’ portfolios with a carefully selected assortment of highly diversified, liquid and low-cost exchange-traded funds (ETFs). These index-tracking investment tools enable our customers to gain diversified, long-term exposure to a variety of asset classes and geographies. So, rather than deciding whether to buy more shares of General Motors or General Electric, we determine how much we should allocate towards North American Large Cap Equities versus Emerging Market Equities, Long Term Government Bonds or Gold, for example. What is an economic regime, and how many are there? The main driver of medium-term market performance is the state of the economy. StashAway’s ERAA® looks at the relative rate of change between growth and inflation to define an economic regime, then to make asset allocation decisions. We have identified four distinct economic regimes based on distinct relationships between growth and inflation: (i) recession, (ii) good times, (iii) inflationary growth, and (iv) stagflation. The bottom-left quadrant in Figure 1 represents a recessionary phase in economic activity. This cycle tends to be accompanied by falling wages, which in turn compromise consumers’ abilities to spend. To the extent that the general prices of goods and services are falling, we have a recession with deflationary price pressure. The Global Financial Crisis of 2008, when the US led the global economy into a recession, is an exemplary episode of Regime A. When the economy comes out of a recession, and growth momentum is sustainably larger than its inflation equivalent, real growth starts to increase. This is an ideal economic environment in which the quality of growth is high. Having bottomed out in the middle of 2009, the global economy started to recover and went into Regime B for a 36-month period between March 2012 and February 2015. As the economy continues to heat up and inflation rises beyond a certain threshold, the quality of growth starts to deteriorate. In other words, “real” growth declines. In Regime C, each additional unit of output is increasingly produced at higher costs. In this environment, investment returns from risky assets are also likely to be falling. Since 2000, the world has witnessed a few short-lived episodes in Regime C (e.g., the US economy from October 2007 through March 2008, and from May 2011 through November 2011). Looking even further back, we have learned from the lessons in the 1980s and early 1990s that the erosion of asset returns from higher inflation could be detrimental to an unprepared portfolio, including a portfolio with too much cash. When inflation is left unchecked and spirals out of control, costs of production for companies and disposable income of consumers could be eroded by price pressures. In other words, inflation “eats” into growth under Regime D, and the economy goes into a rare and horrible combination of stagnation and high inflation, called stagflation. There were several short-lived stagflations in modern times, and classic examples are the global economy before and after the oil embargo of 1973. Leading up to the March 2009, the peak of the 2008 Financial Crisis, the US economy went into stagflation from June 2008 to January 2009. A key feature of ERAA® is that it keeps each individual customer’s risk profile constant throughout any economic condition by systematically re-allocating assets when the economy or the markets substantially change. This process of proactively determining a new asset allocation target for any given portfolio is what we call “re-optimisation”. StashAway’s re-optimisation feature is built to protect customers’ capital by maintaining constant risk throughout different economic and market cycles. ERAA® continuously monitors what economic regime is in effect, and leverages a multitude of different data to manage portfolios systematically, ensuring that asset allocations are always optimised for the given economic environment. Ultimately, ERAA®’s goal is to maximise customers’ long-term returns while keeping volatility, or risk, at each individual customer’s specified level. ERAA® does not aim at optimising for short-term market movements and corrections, rather always takes a long-term view. Re-optimisation can be triggered by one of three events: (i) an economic regime change, (ii) economic conditions that were deemed uncertain by StashAway’s Risk Shield, or (iii) a change in the valuation of one or more asset classes. These are the 3 pillars, which are further discussed below, that underpin ERAA®. StashAway will re-optimise a client’s target portfolio in the case that there is a change in economic conditions. Investors can expect changes driven by this event to occur every 3-7 years, and for the changes to the portfolio to be significant. In turbulent times (e.g., 2008 Financial Crisis), changes to a portfolio could be more frequent than once every 3-7 years; in fact, changes would have occurred multiple times within the year leading up to the financial crisis: four changes of regimes between November 2007 and February 2010. Because the expected returns and risk profile (or volatility) of each asset class varies significantly across the four economic regimes, as previously discussed, it is imperative to adjust the composition of any investment portfolio when an economic regime changes. So, for example, when the economy moves from “healthy growth” to a recession, an optimised portfolio’s exposure to equities will decrease and its fixed income (bonds) and Gold will increase. In this scenario, the equity portion will contain more defensive sectors, such as consumer staples. An asset’s returns and volatility behave differently in different economic environments. In general, equities are expected to perform well when growth is positive and running with greater momentum than inflation. However, not all equities are made equal. In good times, small-cap growth equities will outperform stocks in defensive sectors, such as consumer staples. Conversely, when the economy contracts, defensive equities will likely fare better than growth equities. On the contrary, bonds and Gold tend to do better when the economy does not do well. Therefore, when optimising a portfolio, it is of paramount importance to look at an asset class’ returns and volatility in the context of the economic environment. Let’s take Large Cap North American Equities, and let’s use SPY, the ETF tracking the S&P 500, as the example in point. A misleading way of looking at the SPY is to look only at its long-term average historical return of 9.8%. Between January 1982 and December 2017, the US economy has spent 11.6% of its time in Regime A, in which the S&P 500 returned an average return of negative 10.3% YoY. It spent 50.7% of its time in Regime B, with +16.4% returns YoY; 28% of its time in Regime C, with +8.8% YoY; and 9.7% of time in Regime D, with +2.7% returns YoY (see Figure 2). To further our point that asset classes’ performances depend on the economic conditions at play, we’ll add that the S&P 500’s volatility (or risk) increases significantly in a recession, going from 14.7% average annual volatility in good times to 19% average annual volatility in a recession. This is why, to improve risk-adjusted returns for our customers, StashAway adapts each portfolio’s asset allocations to medium-term economic cycles by harnessing each asset’s characteristic behaviour in the given regime. In short, simply looking at long-term averages is not an option if you are looking to keep a portfolio’s risk constant and maximise investment’s returns across all economic environments. What happens to StashAway portfolios when economic data are not clear? If growth is 0.1%, is this “positive enough” to invest in a growth-oriented portfolio? If growth is negative 0.1%, is the right thing to do to have a defensive portfolio? In the face of unclear economic data, ERAA® first looks at the momentum (rate of change) of growth and/or inflation to see if there is clear guidance on direction. If the momentum is not solid enough to provide predictive guidance, ERAA® resorts to adjusting clients’ portfolios to an All-Weather strategy that is specifically designed to simultaneously protect capital and perform well in uncertain economic conditions until clarity is once again achieved. 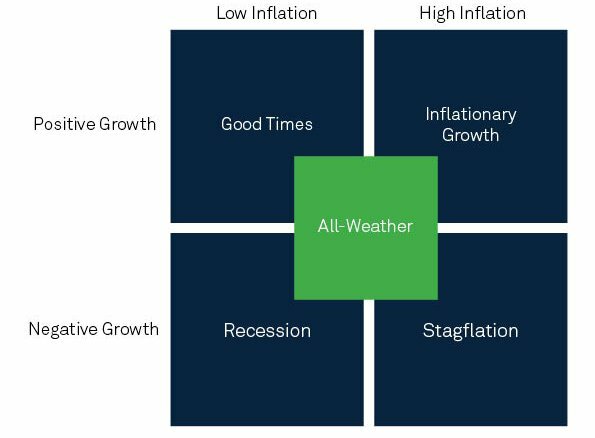 The All-Weather portfolios will differ if the uncertainty is relative to growth, relative to inflation, or both. In addition to evaluating macroeconomic data to determine the economic regime at play, ERAA®, also reads signals of an increasingly probable significant market crash in order to react proactively and promptly to protect clients’ capital. It does this by monitoring the markets’ behaviour in a given economic environment. Through the use of technical analysis on risk factors, ERAA®’s system determines whether the markets are synchronised or “out-of-whack” with economic data. The case in which ERAA® responds to abnormal market behaviour is when it spots the presence of two or more death crosses in market prices. A single death cross is defined by a shorter-term exponential moving average crossing below a longer-term equivalent (i.e. the shorter-term dips below the level of the longer-term moving average). The timeframes used by these exponential moving averages are determined by ERAA® based on the cyclical behavior of the underlying asset prices. As an example, timeframes for computing the exponential moving averages could be 26-day, 69-day, 252-day, or longer. When there are multiple death crosses, ERAA® would automatically overrule the economic-driven parts of the model, and move customers’ portfolios to a protective strategy until the market regains clarity. In the last two bear markets (August 2000 to October 2002 and September 2008 to March 2009), had economic data not predicted them, this risk management mechanism alone would have reduced peak-to-trough losses by 78.8% and 82.9%, respectively. The Risk Shield runs daily, and portfolio changes can be triggered at any time. StashAway re-optimises a client’s portfolio also in the case that an asset class is excessively overvalued or undervalued. In the first case, ERAA® will recommend a reduction in the exposure to the asset class, while in case of undervaluation, StashAway will adjust upward the expected future returns and therefore increase the allocation toward the asset class. Our system continually compares each asset class’s fair value to actual market valuations. When there’s a gap in the valuation, it’ll adjust a client’s portfolios’ asset allocations accordingly. So, if Asian Equities were priced lower than the data suggest they’re worth, the system would adjust a client’s portfolio to capture the potential future value. Investors can expect changes driven by valuation adjustments to happen once or twice in a year, and for the changes to be focused on 1 or 2 asset classes each time. These portfolios adjustments are significantly smaller than the ones driven by Pillar I and Pillar II. For an illustration on how ERAA® re-optimises portfolios to account for the difference in valuation, please refer to Figure 3. As can be observed, the actual 3-year total return for XLK (US technology) and ERAA®’s model expectation tend to trend together over time. However, they do not track each other perfectly, hence resulting in a gap between actual and model total returns. This gap is known as a “valuation gap”, and is shown as the green line that represents the difference between the red and black lines in Figure 3. When the valuation gap is high, it means that the market valuation for XLK is relatively overvalued versus growth, inflation, and interest rate expectation. Overvaluation is usually a symptom of overcrowding and irrational exuberance, so in this case would constitute a riskier outlook for XLK. In response, ERAA® would have reduced the expected return for XLK by the amount of the valuation gap per year. ERAA® also would have raised the volatility of XLK based on the statistical relationship between XLK’s returns and volatility. In the case of an overvaluation of XLK, lower expected return and higher volatility would induce ERAA®to reduce its allocation for XLK. It does so by selling XLK and buying other assets in an amount that keeps the portfolio’s risk level constant. Conversely, when the valuation gap has been significantly negative, that means that the market valuation for XLK is relatively low given the economic situation. In this case, ERAA® would raise the expected return and reduce the volatility for XLK accordingly. ERAA®’s systematic and economy-driven approach would have worked well in past financial crises. This can be illustrated by reviewing how the 2008 Financial Crisis unfolded. As depicted in Figure 4, the US economy was moving from Regime B (good times) to Regime C (inflationary growth) as early as late 2007. This period was characterised by positive growth with an inflation rate that was higher than 3.1%. Six months later, the economy shifted from Regime C (inflationary growth) to Regime D (stagflation). The first warning sign on growth came in May 2008 when US industrial production registered its first negative print of -1.0% YoY. It turned out that growth momentum had turned negative while headline inflation was around 4.1% and rising. By the time Lehman Brothers failed in September 2008, US industrial production had deteriorated from -1% to a low of -8.3% YoY and the economy had been showing negative growth for 5 months. Post-Lehman bankruptcy, headline inflation managed to stay around 5% for some time. It was not until December 2008 that the first negative inflation momentum was observed. Thereafter, inflation started to dip rapidly. By February 2009, the US economy had shifted from stagflation to a regime that was simultaneously in a recession and low inflation (Regime A). In brief, ERAA® would have spotted the first signs of trouble and started reducing portfolio risks as early as May 2008 when the economy went into stagflation. By December 2008, when negative inflation momentum was observed, the investment algorithm would have made another shift, from a stagflationary portfolio to a recessionary portfolio. The benefits of this approach can be observed in Figure 4. Throughout the crisis, an ERAA®-balanced portfolio would have significantly outperformed both the S&P 500 as well as the 60-40 stock-bond benchmark. It also would have had significantly fewer drawdowns, leading to better performance after the 2008 Financial Crisis. Studies have shown that the majority of returns come from asset allocation. History has also shown us that it’s the economy, not the markets, that ultimately drives returns over the medium to long term. Traditionally, asset allocation strategies target risk, but do not inherently manage risk proactively. At StashAway, we integrate a comprehensive and proprietary risk management strategy with our asset allocation strategy, giving rise to ERAA®, which maximises returns and minimises risk for retail and accredited investors alike.